Home › Gear Review › Peek in Our Tack Trunks – Karen S.
Peek in Our Tack Trunks – Karen S.
My mare is very picky when it comes to horse treats but she absolutely loves these treats! I always make sure to have a 3-pound bag on hand in her favorite flavor, Blackberry Vanilla. She can’t get enough of these treats and checks my hands and pockets for a few after each ride! This sheet has been my favorite go-to sheet for the Quarter Horses that I have owned over the years. They hold up really well, last for years and are the perfect fit for my hard-to-fit, bulky mare. This sheet is perfect for layering under winter blankets, on cool fall or spring days and for keeping Macy clean at shows. This halter was soft and supple from day one and became an instant favorite of mine. I love that it is fully adjustable which made it easy to fit my mare’s petite head. I added the optional halter nameplate with Macy’s name giving it an extra touch. This halter is perfect for the barn and fancy enough for her to wear at shows! These boots are absolutely the best pair of boots that I have ever owned (and I have owned a lot of boots!) The square toe and ostrich make them perfect for a day at the barn or fancy enough when I’m in the show pen. The J-Flex Flexible Comfort System insole is very comfortable and ensures that my feet never hurt even after wearing these boots all day! I’m always getting compliments on these boots! I was surprisingly able to use this work headstall the day I got it without any oiling or conditioner, because it was so soft and supple! It has buckle ends, which are great, allowing me to quickly switch bits so I don’t have to own several different bridles, which my bank account appreciates! I really like the look of the single ear piece and have been impressed with how well this headstall has been holding up. This is my favorite secret show-grooming product! The white and black sprays can always be found in my tack trunk. I use the white spray to quickly brighten and highlight white markings while the black is perfect for my bay mare’s legs. This spray ensures that my mare is looking her best with a polished, finished look whenever we hit the show pen. This hose nozzle makes Macy’s bath time a breeze. She isn’t a fan of baths so the least amount of time that I need to spend fighting with a hose nozzle, the better! The two-way on/off feature is great, especially when my hands are covered in soap and slippery. The adjustable spray pattern makes this nozzle perfect for bathing time, cleaning buckets or any other job you have around the barn. My whole barn has been using this fly spray at horse shows for years! 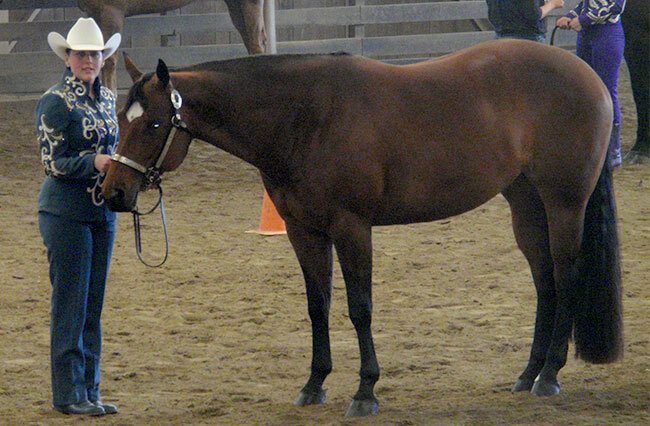 My mare is very sensitive to flies and as a result she easily gets distracted by them, which isn’t what I want in the show pen. This fly spray really repels the flies and keeps them off of her so her focus is on me instead. I also find that this fly spray lasts a lot longer than other fly sprays so I don’t find myself reapplying it throughout the day. I also love how easy the aerosol applicator makes it to apply and that it doesn’t leave streaks on my horse like other fly sprays often do. This saddle pad has been my go to western pad for years. It provides excellent shock absorption and thick cushioning which keeps my horse’s back protected and comfortable whenever we are training or in the show pen. Macy is rather stocky but this saddle pad does a great job of keeping my saddle in place and centered on her back.